I don’t know about the little people in your world, but my little people are persistent. And often impatient. Pregnancy & mothering involve patience. Waiting. I’m counting down days until I meet this newest member of our family. I’m waiting for my boys to learn certain character qualities. When I respond in frustration when my boys are challenging I’m not believing that God has it under control. IF I believe God is God & that my boys ultimately belong to Him, then I will be more patient. I can wait on the Lord to grow character in them. Do you struggle with patience? What are you being called to wait for right now? Do you trust God to handle it? 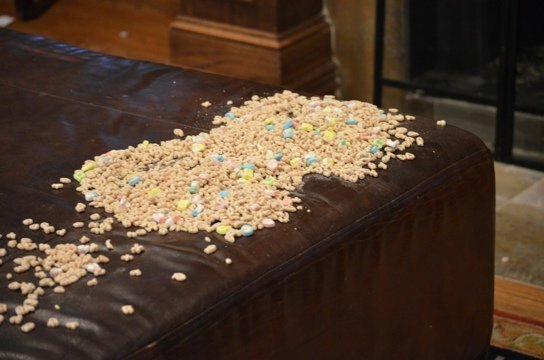 I leave you with a picture of what happened this week when my boys decided to get themselves some cereal instead of waiting a few minutes for me to get it for them. Sometimes impatience & taking things into our own hands leads to big messes. Isn’t it amazing what we learn from the kids we are trying to teach? This is a wonderful analogy. Great picture! Oh how true it is. – Patient is a fruit of the Spirit. Not a result of our effort. so good! yes, patience is completely empowered by the spirit. I’ve almost prayed outloud “Lord give me spirit-filled patience”. thank you!